Date & start time: Monday 3rd August 2009. 10.30 am start. 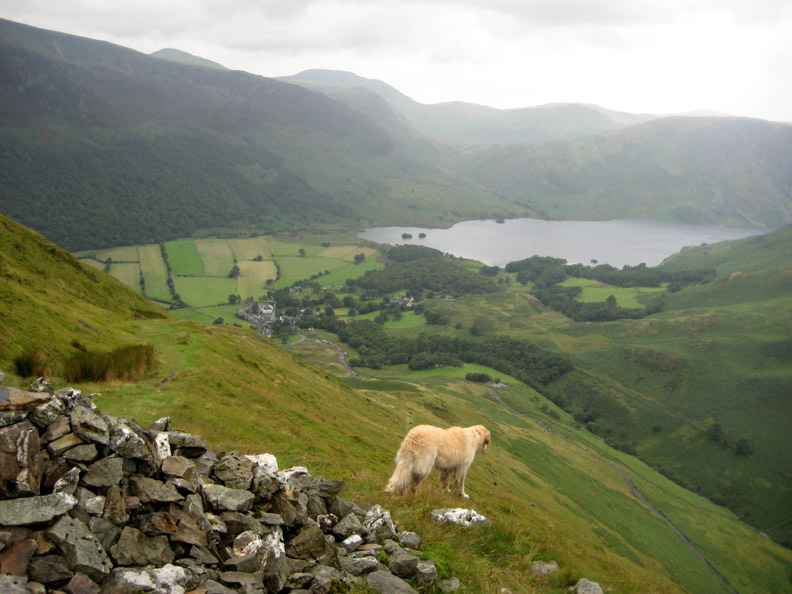 Places visited : Honister, Dale Head, Hindscarth Edge, Hindscarth, Littledale Edge, Robinson, Buttermere Moss, Buttermere, Syke Farm Tearooms. 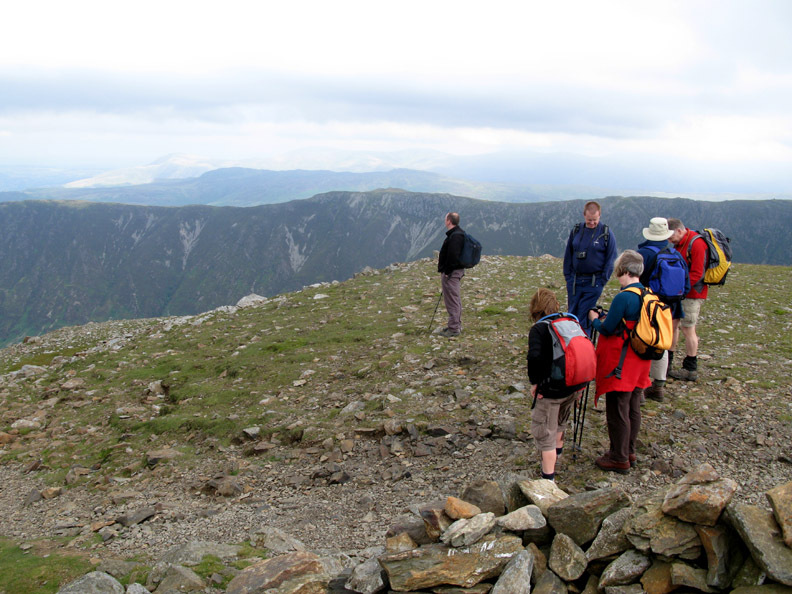 Walk details : 6.2 mls, 2200 ft of ascent 2950 ft of descent, 6 hrs 10 mins incl lunch. 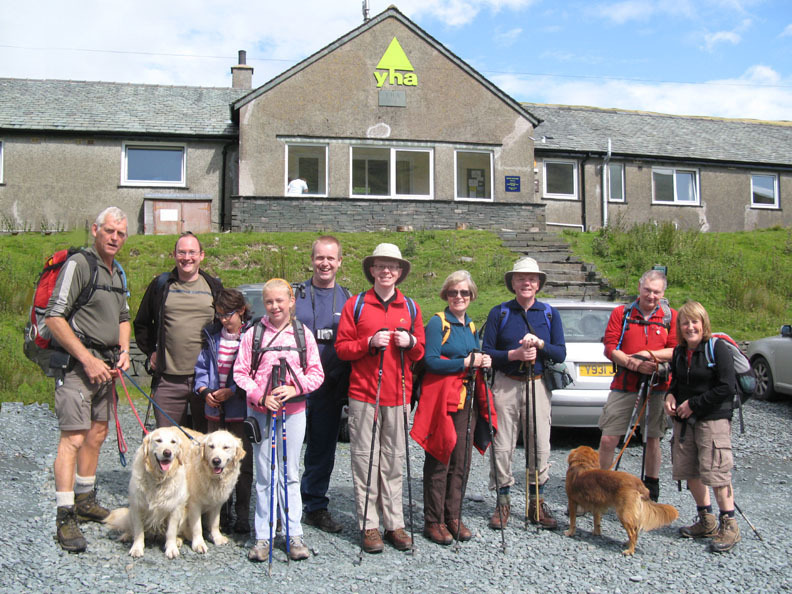 Walked with : Geraldine and Martin Scott and their son Jonathon (Jon), Ian and Megan, Simon and Beth, John P, Ann and the dogs, Polly, Harry and Bethan. Weather : Fine and dry with some sunshine to start, grey and damp with some showers to end. 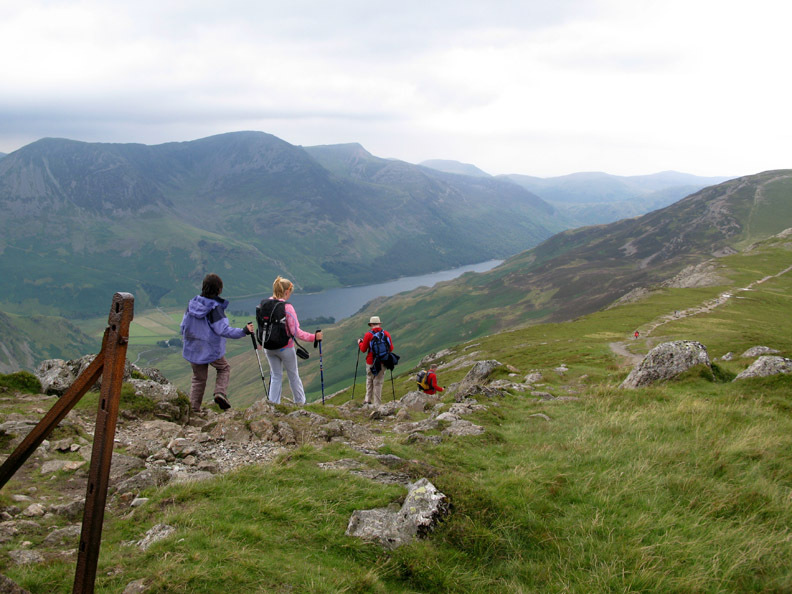 we traverse the ridge from Honister Mines and Dale Head down to the tearooms at Syke Farm, Buttermere. 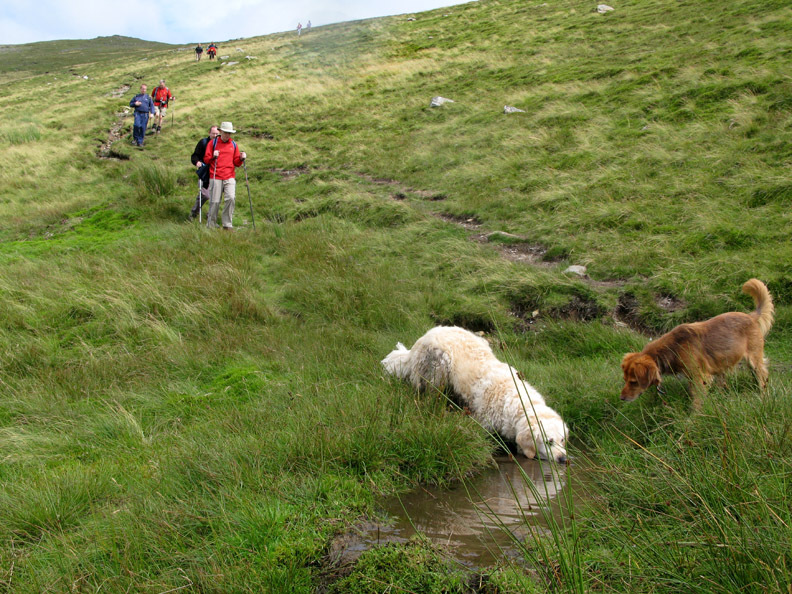 A great walk and chance to get to know some new friends. A composite and complete group photo of our group at the start of the walk . . . photo . . . half by Ann and half by myself. Done without the aid of mirrors . . . you can't even see the join . . . clever stuff this Dreamweaver ! Myself, Ian, Megan, Beth, Simon, Jon, Geraldine, Martin, John and Ann. 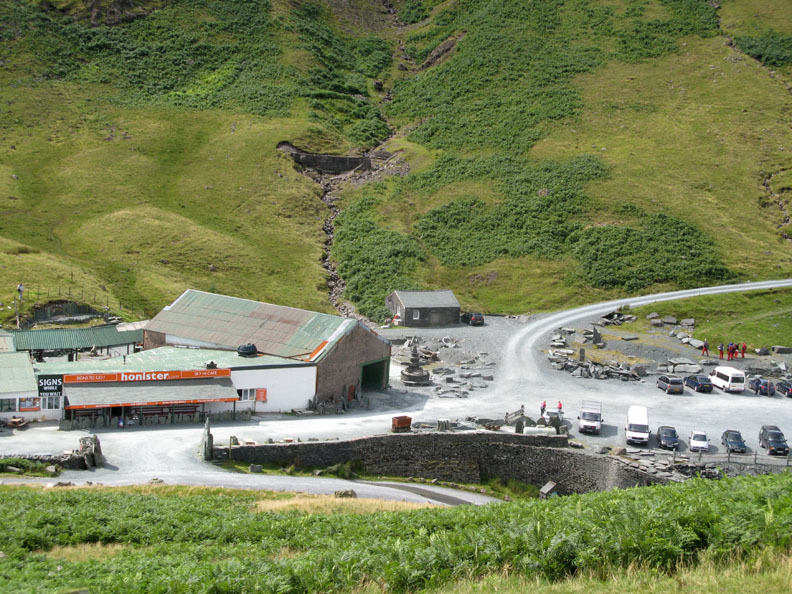 Looking down on Honister Mine workshops and car park as we start our climb. 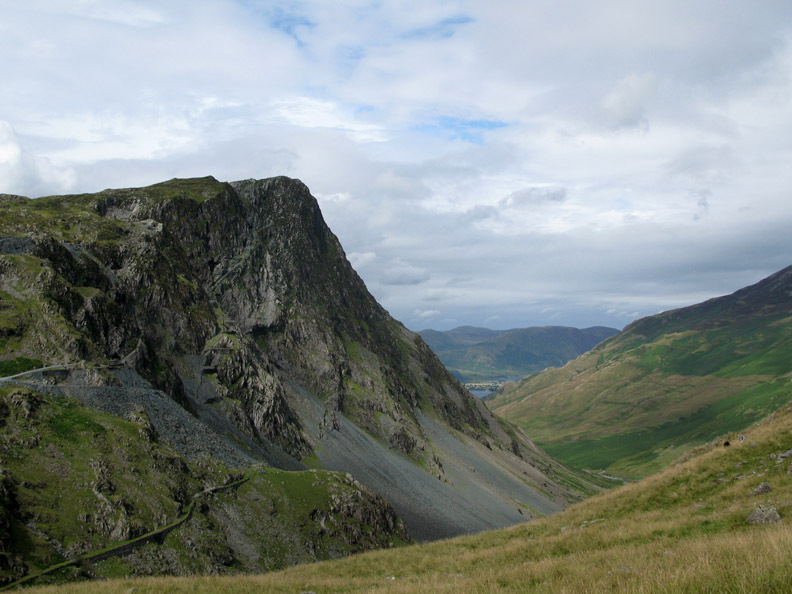 Honister Crags . . . the visibility today is superb, even though the weather forecast isn't. 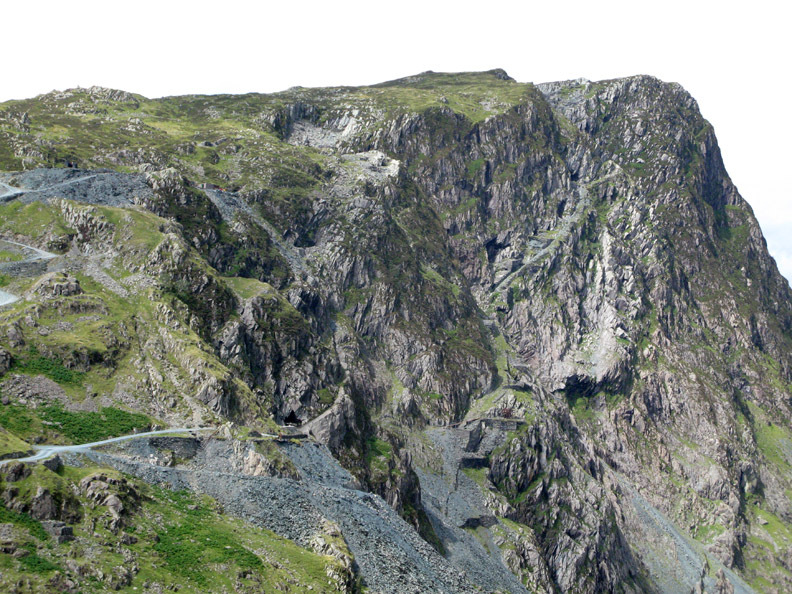 The line of the first Via Ferrata starts at the mine entrance, the triangular black hole on the lower third of the photo. After a short underground section it climbs up the old funicular railway track diagonally up the crags. I haven't done the new Via Ferrata which I understand is more exciting but more physically demanding, including a zip-wire descent as part of the course. Back to our walk . . . 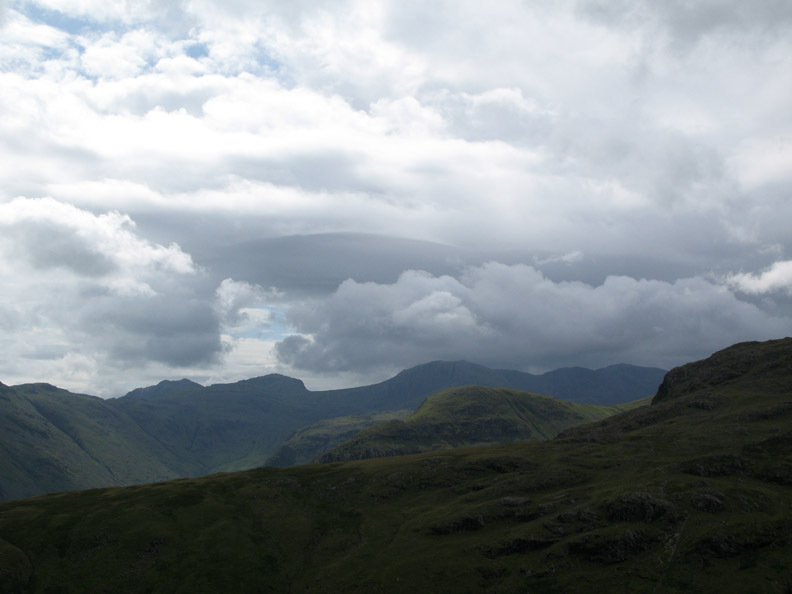 Interesting clouds over Bowfell, Esk Pike, Great End and the Scafells opposite. The cloud base is slightly higher than when I was sitting up there yesterday ! 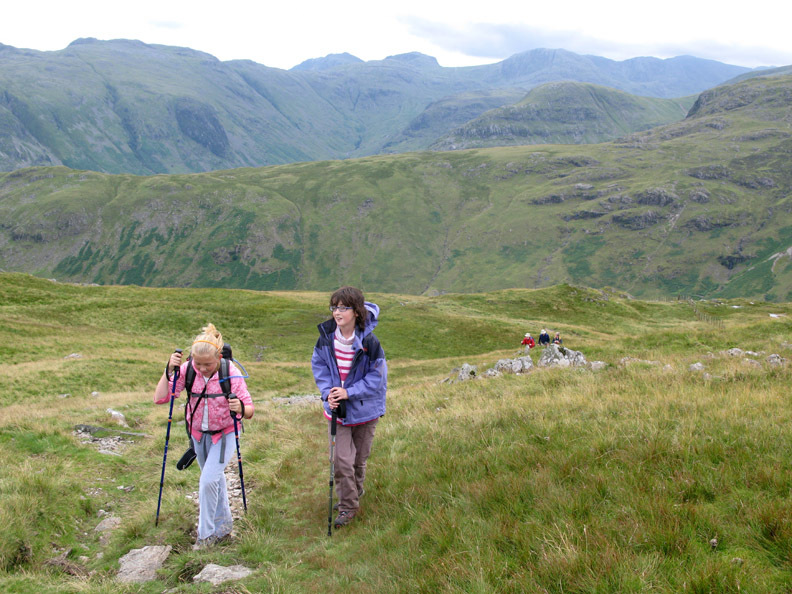 Beth and Megan chat their way up the fell. 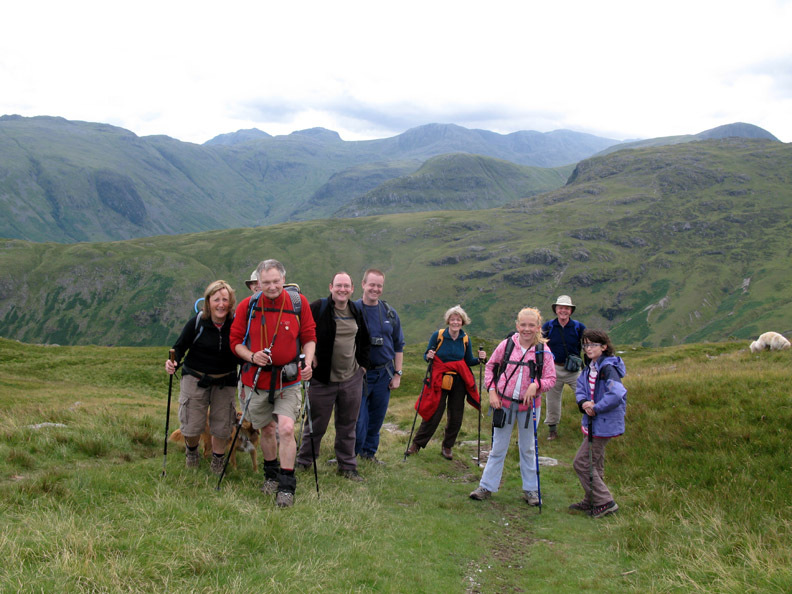 We stop to re-group after a short, steeper section of the Dale Head ascent. 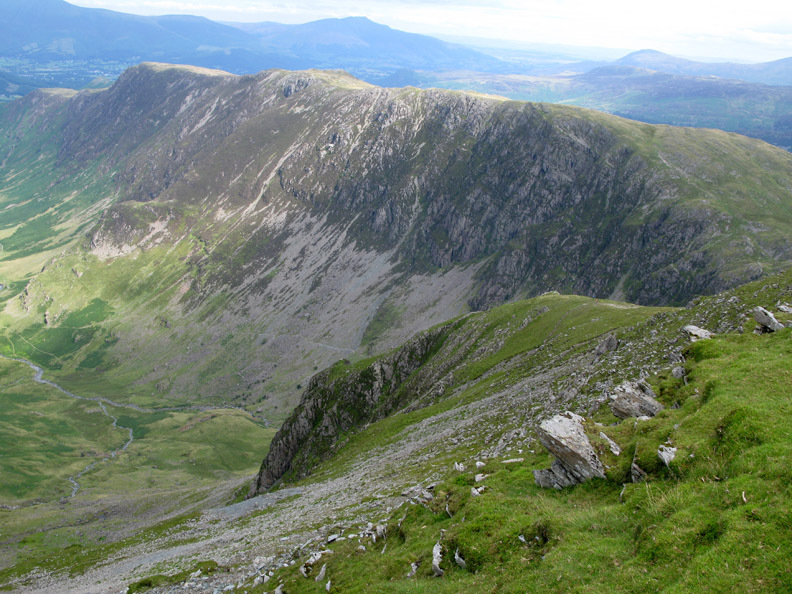 The path climbs close to the top of the Yew Crag Quarries on this side of the valley. 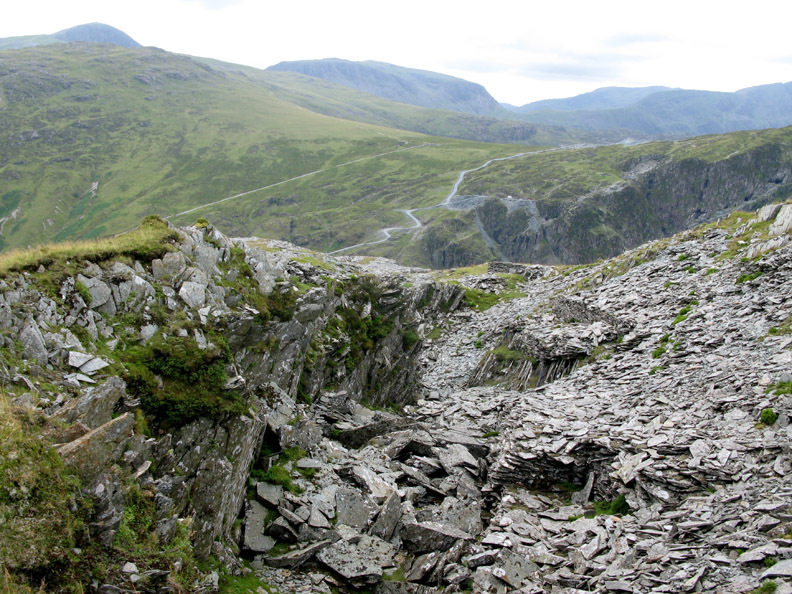 These have long since been abandoned but were an important part of Honister's 400 years of slate production. Slightly higher up, this quarry was deepened at some point and access to the deeper section was gained through a short tunnel. More photos of a previous visit to the tunnel can be found here. Underway again, reaching a staggering speed of probably one hundred words per minute. Peace and tranquility . 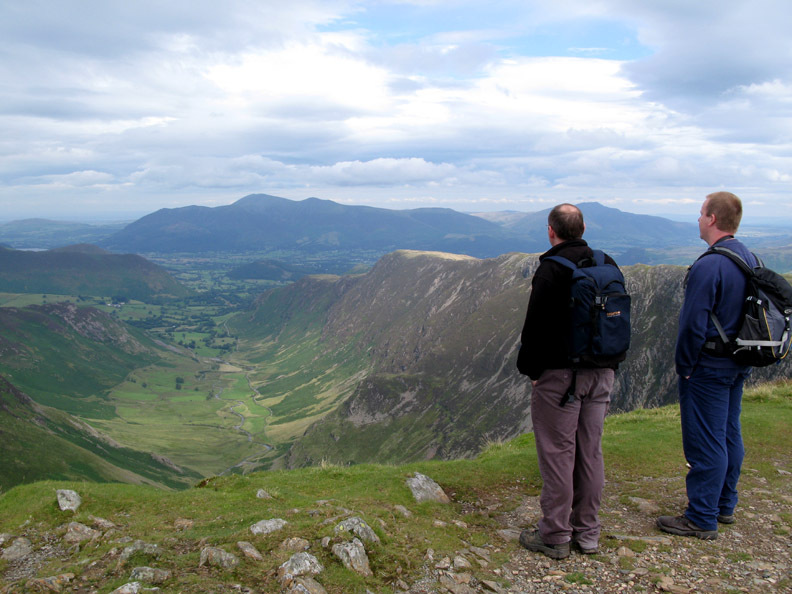 . . words are unnecessary as Ian and Simon look down on the classic Dale Head view of Newlands Valley. 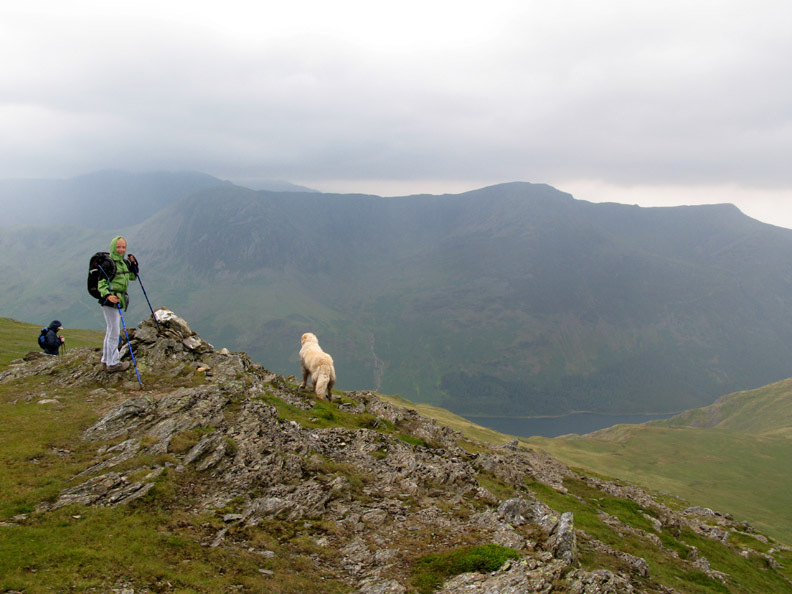 The Dale Head Crags just below us share the famous name of "Great Gable" with the more well known fell some distance behind us. 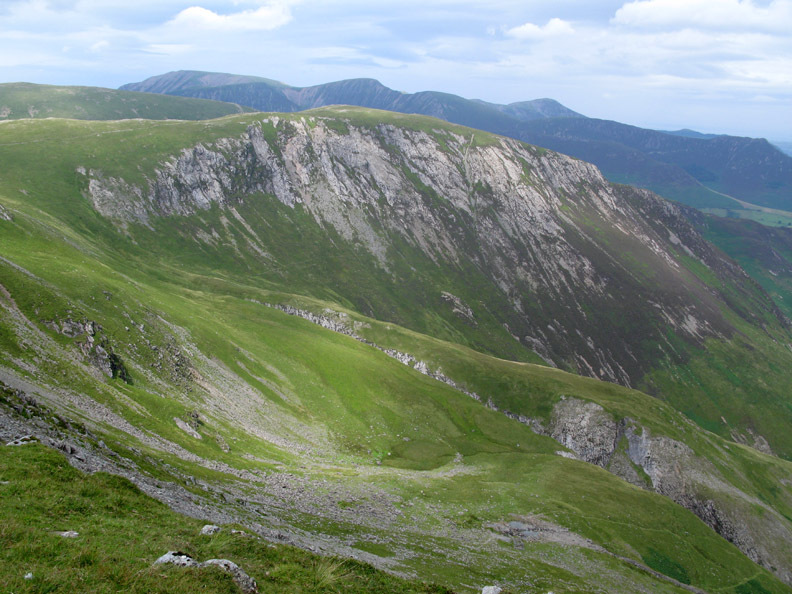 The silver crags of Hindscarth seen above Far Tongue Gill, the Tongue and Near Tongue Gill, hidden below the heathery crags. 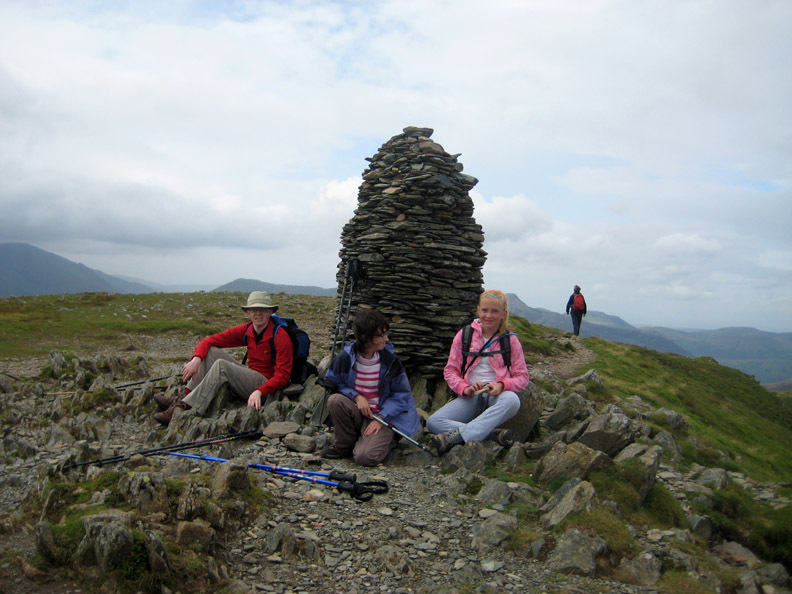 Jon, Megan and Beth rest by the summit cairn. 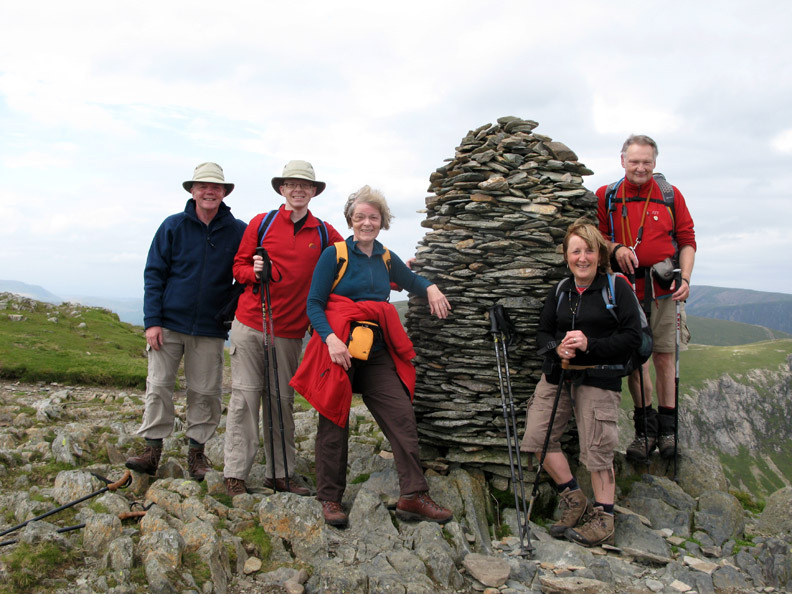 Martin, Jonathon, Geraldine, Ann and John pose for a summit shot. Ann and I have got to know the Scotts through Loweswatercam correspondence, but it's taken a few years for us to meet up for a walk. Time for lunch . 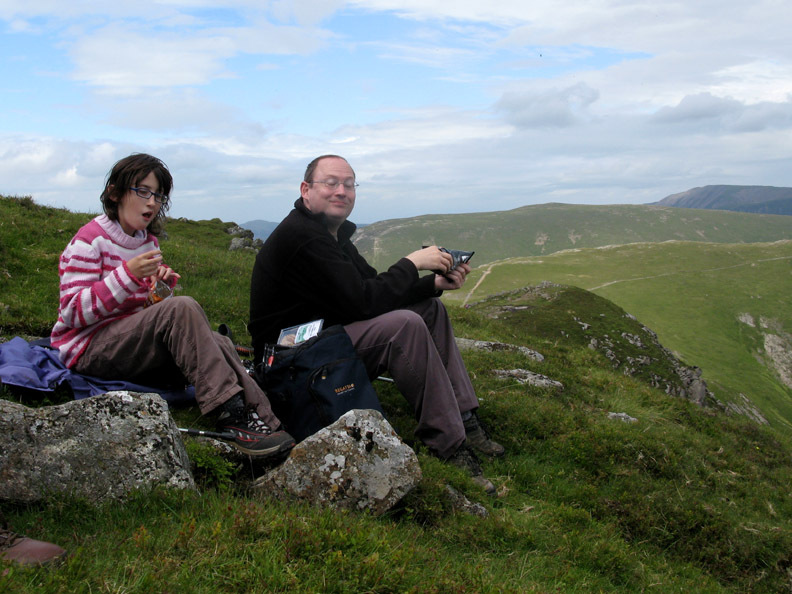 . . Ian has superior crisps, not just your average Walkers . . . "Yeh Yeh whatever" says Megan ! A feint but definite arch of colour presents itself as we look down from our lunch spot. John also tries for a photo. Rainbows need sun . . . and some raindrops . . . off which to bounce. As the wind was blowing from behind us, this means this was the first shower of the day that crossed our path. 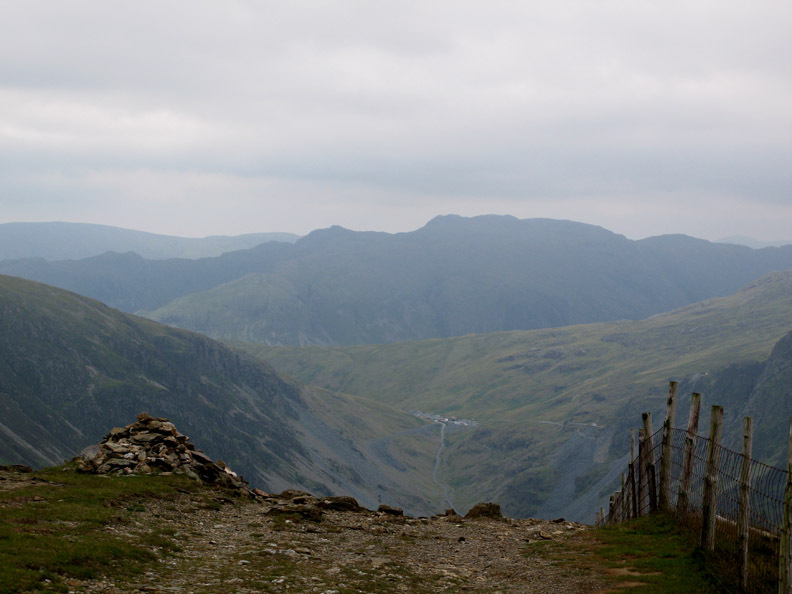 we continued our way down Hindscarth Edge on the next stage of our walk. A small pool marks the mid point of the edge . 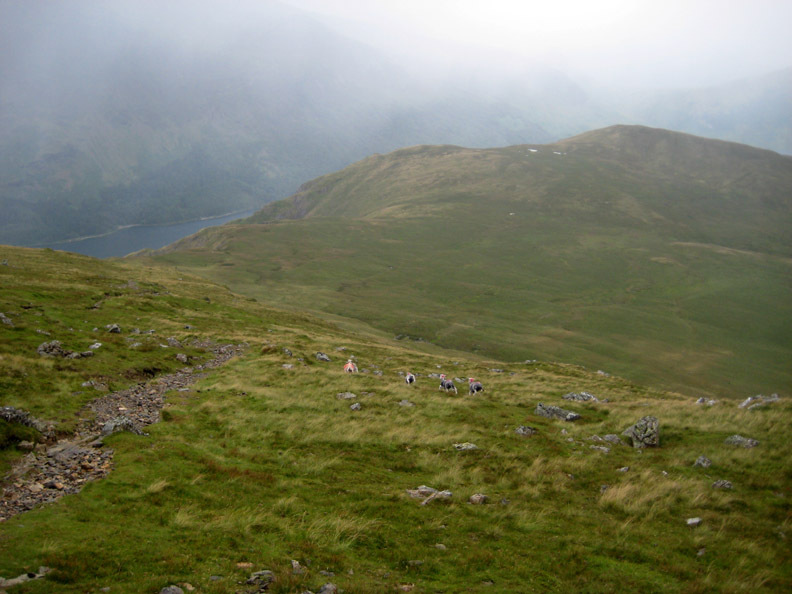 . . from here the path starts to climb again to Hindscarth. 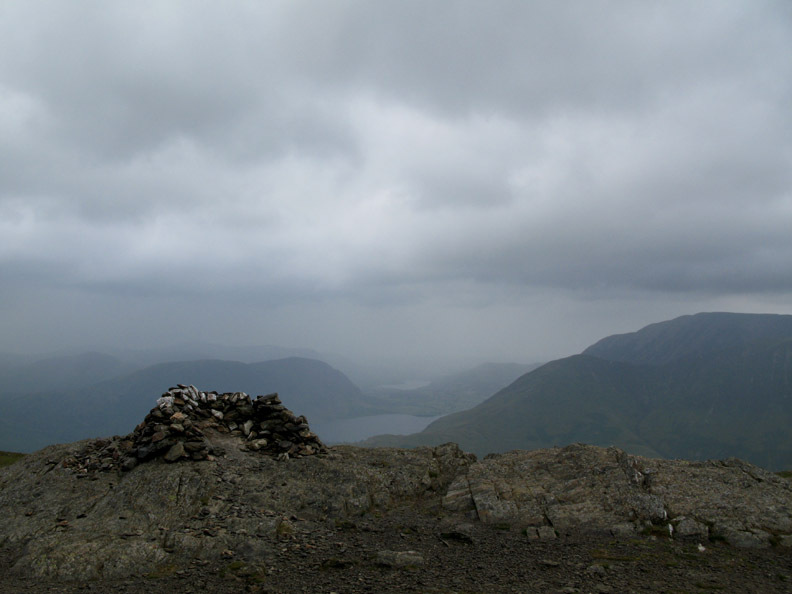 Distant Skiddaw and the lower shelter from the summit of Hindscarth. 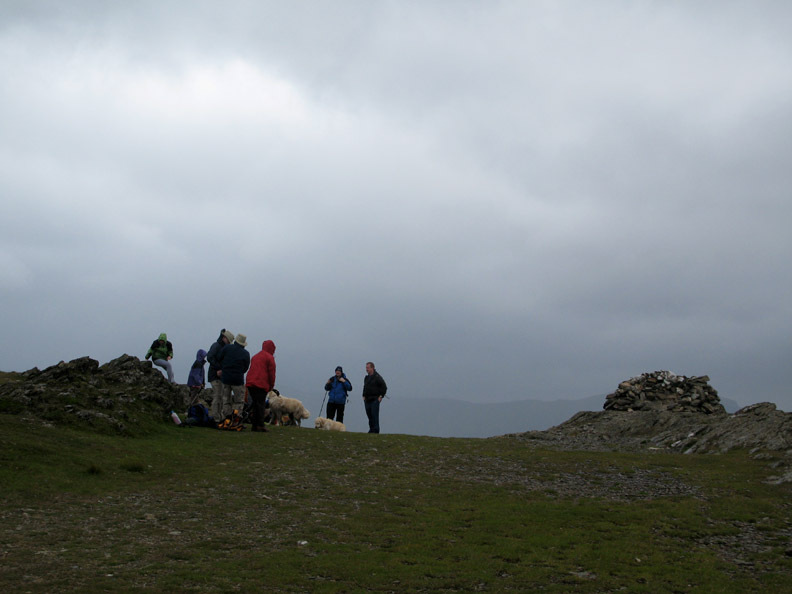 We walk down the short distance to the shelter to view the Scope End Crags below. 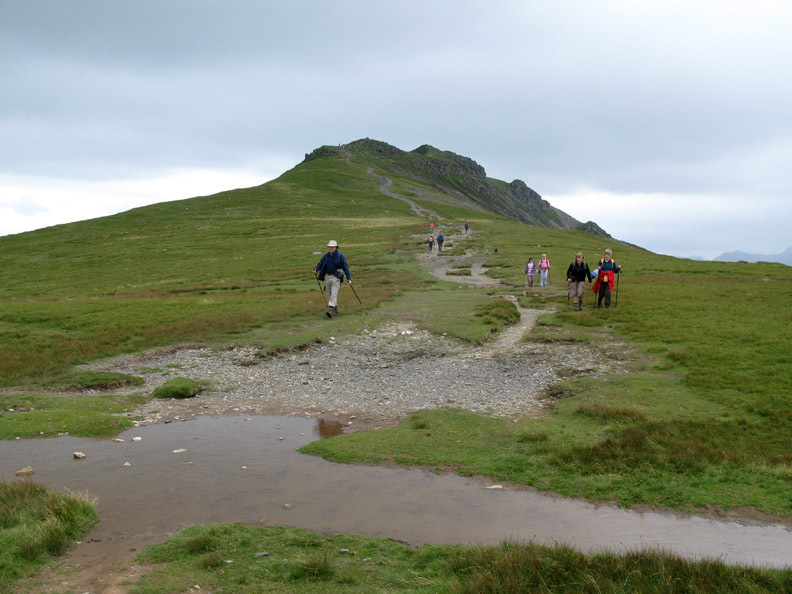 The ridge opposite is High Spy and Maiden Moor leading down to Catbells (out of sight to the left). 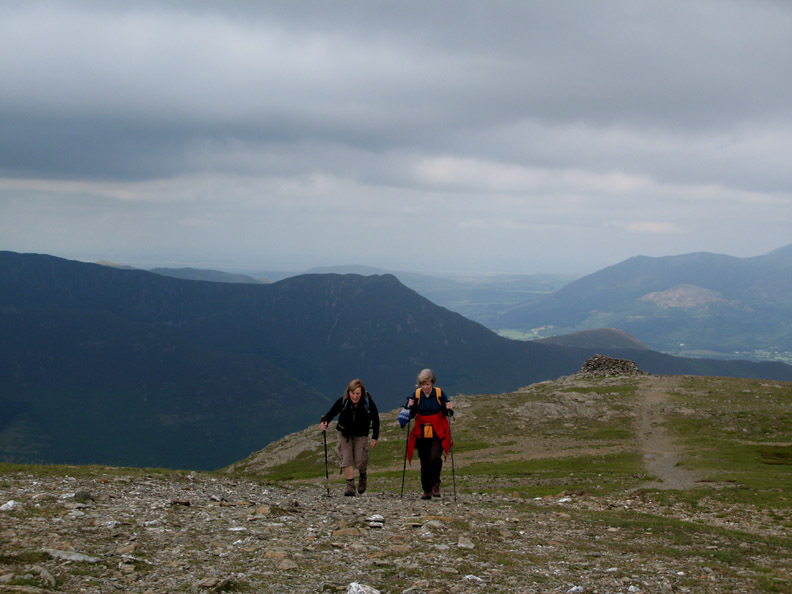 Ann and Geraldine walk back up the slope, retracing our steps to the summit of Hindscarth. 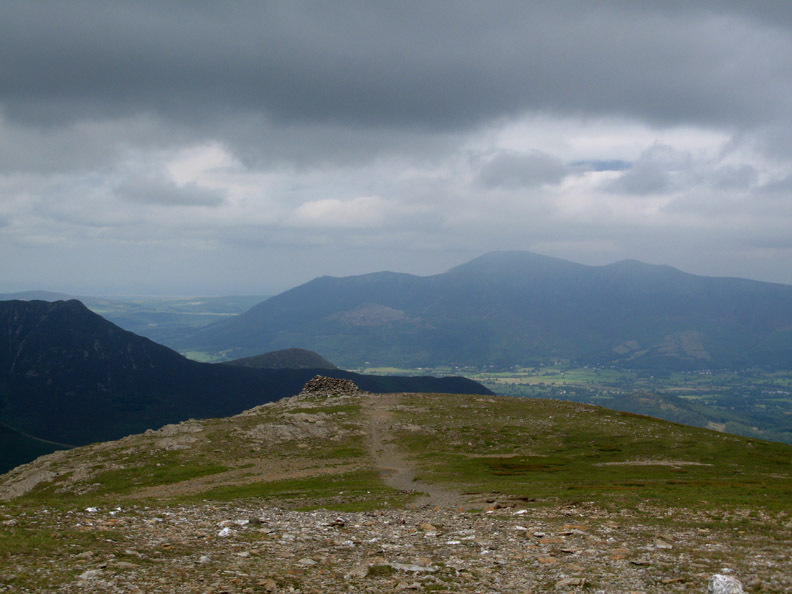 The darker silhouette of Causey Pike with it's distinctive summit outline can be seen behind. 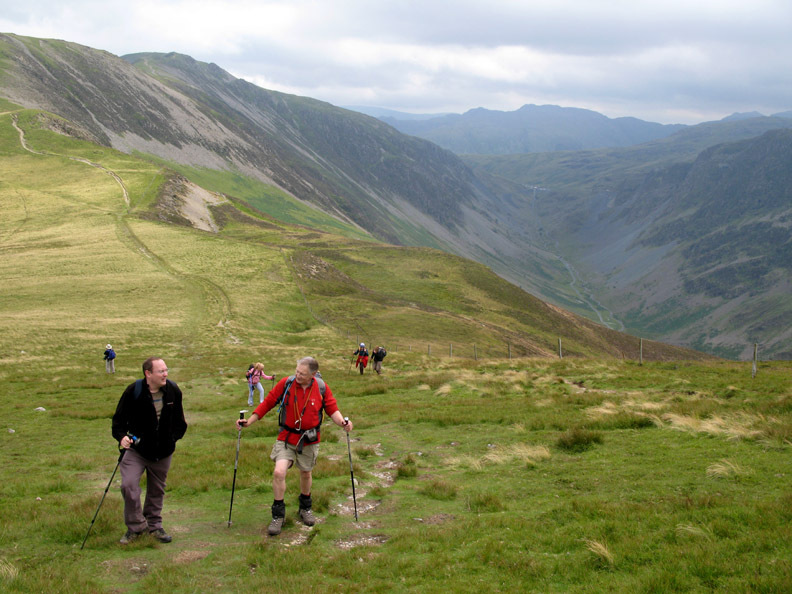 We take the diagonal path leading round the Little Dale Valley between Hindscarth and Robinson. Harry was quietly minding his own business when this local trots over for a chat.
" Hey Polly . . . if you pretend to be drinking you can appear to accidentally fall in this deep pool . . . and get really muddy ! " For a walk that is basically down hill, there's quite a lot of ups too. 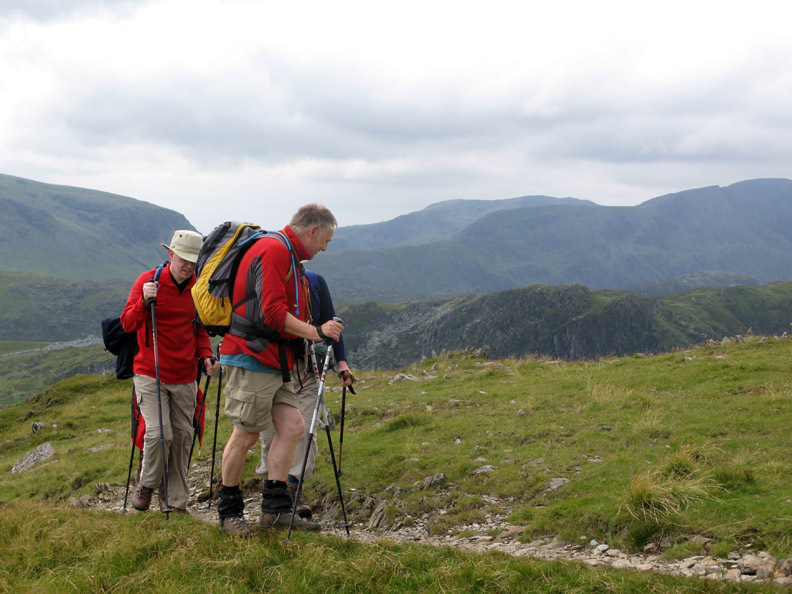 Ian and John start the climb up from Littledale Edge to Robinson. Our start point at Honister is now quite some distance away. Robinson's Summit shelter perched on the rocky top stands proud whilst all around is turning a bit damp. Time to put on a waterproof layer, as we pause on the distinctive double summit rocks. We've managed to avoid most of the showers, but the last few have come our way and there's no point in getting wet. 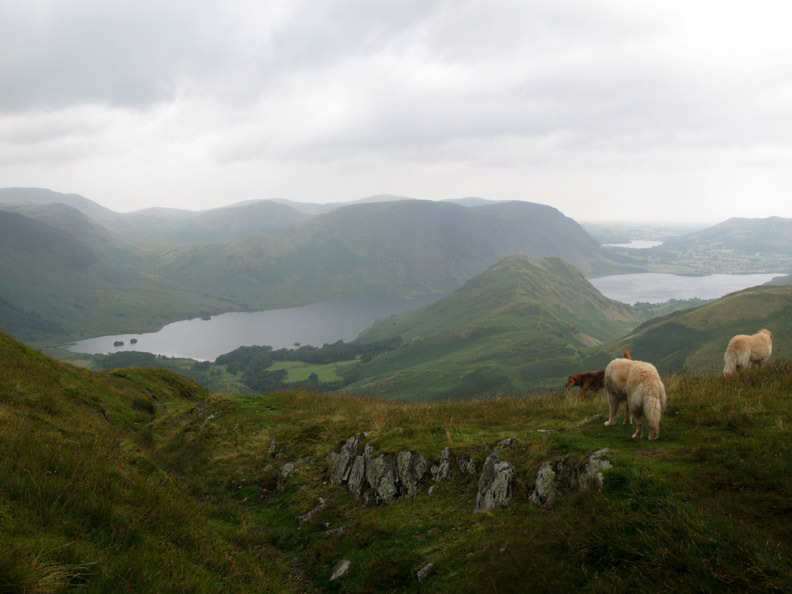 The last ascent done, Beth now looks down on our downward route towards High Snockrigg and Buttermere Moss. Time to pick a route across the flat boggy ground. What's the weather been like the last few days ? 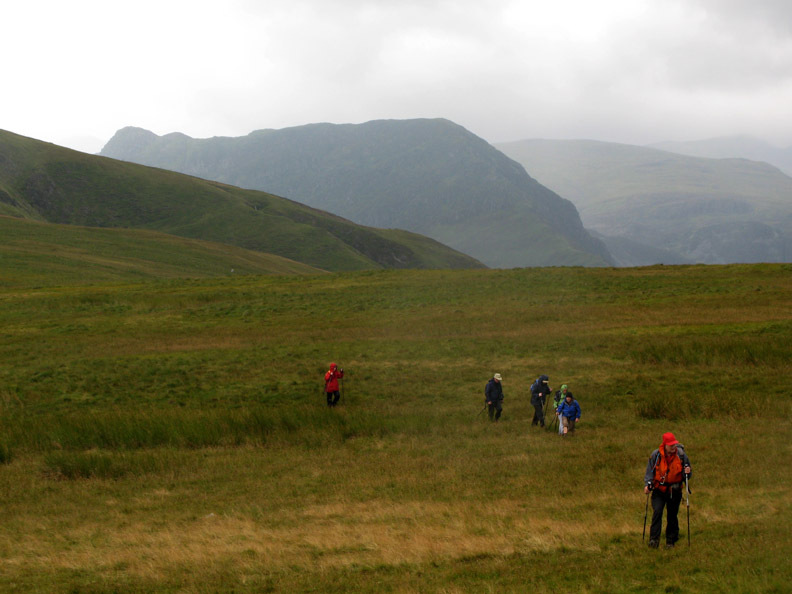 We could keep to the high ground to the left, or take one of the two routes across the flatter ground of the Moss. We settle for the middle ground and have a reasonable crossing. 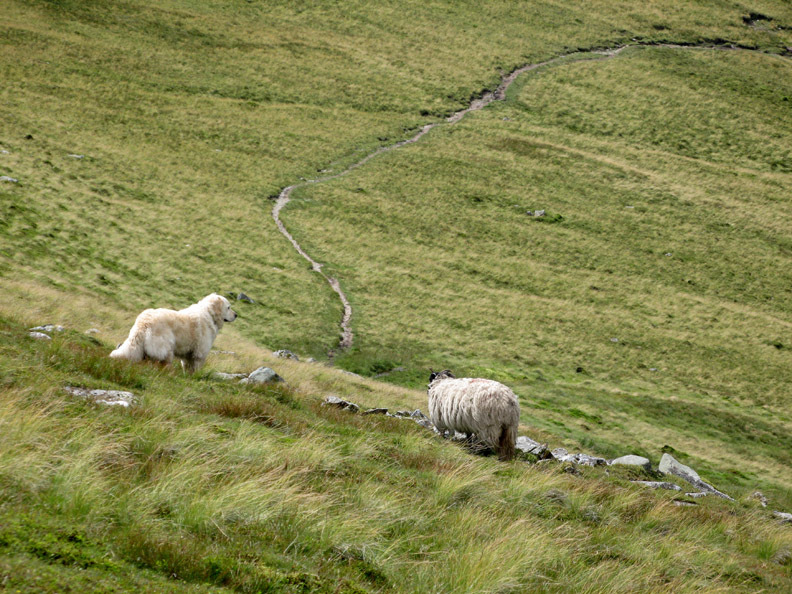 Leaving the actual High Snockrigg summit for another day, we head straight for the peat track path off the fell. 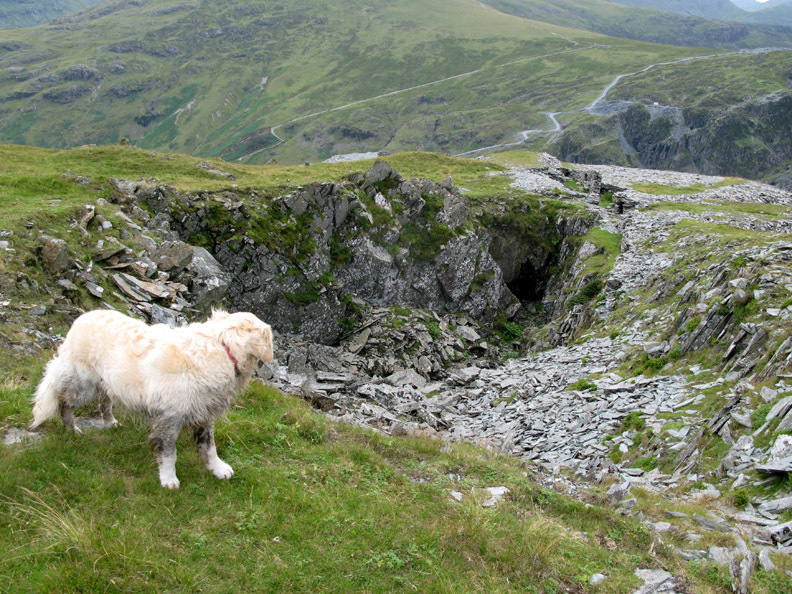 Bethan looks down into the Mill Beck Valley and the Newlands Pass road below. 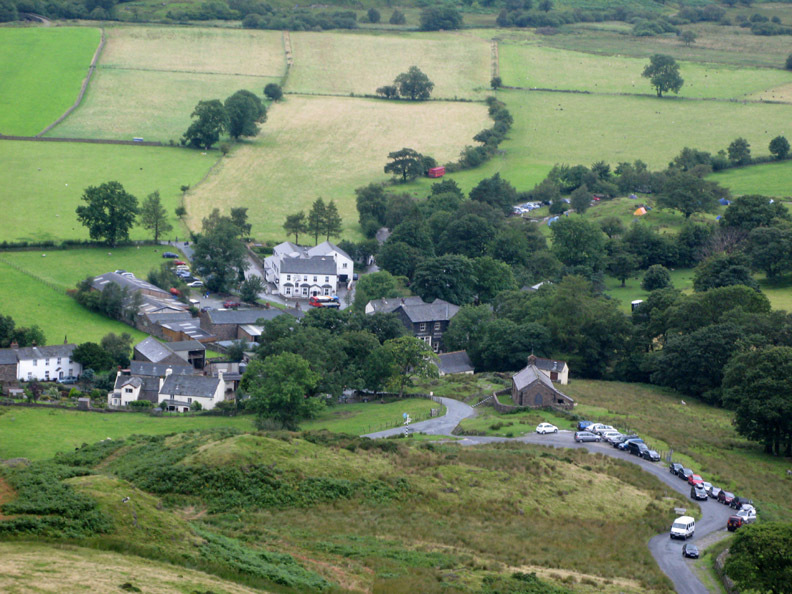 Plenty of cars parked by the Church as we make our way down to Buttermere Village.
" Mmm . . . will anyone be serving Carrot Cake today ? " 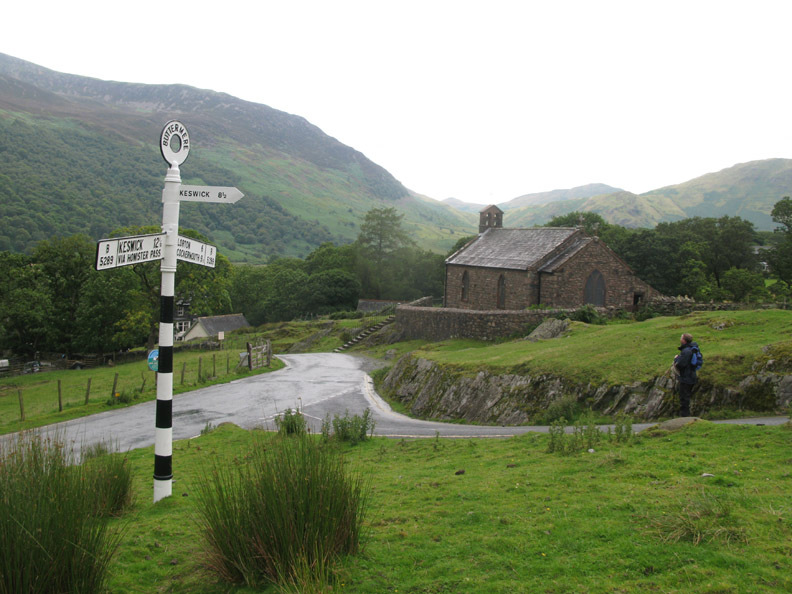 The signpost at the junction near Buttermere Church. The roads are wet but I think we've got away quite lightly as the waterproofs were hardly needed. 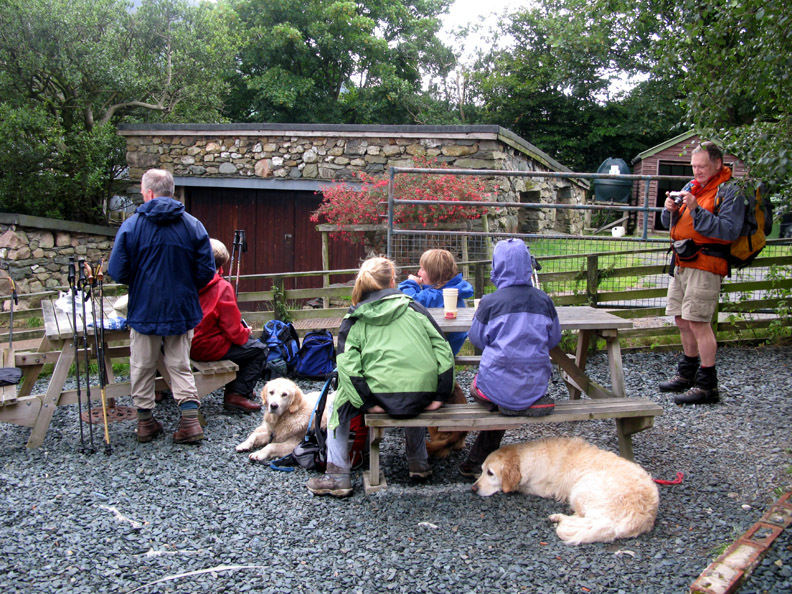 Syke Farm tearooms have a slate garden where we can relax with the dogs . . . Sorry no Carrot Cake, but they did a mean slice of Coffee and Walnut instead. This site best viewed with . 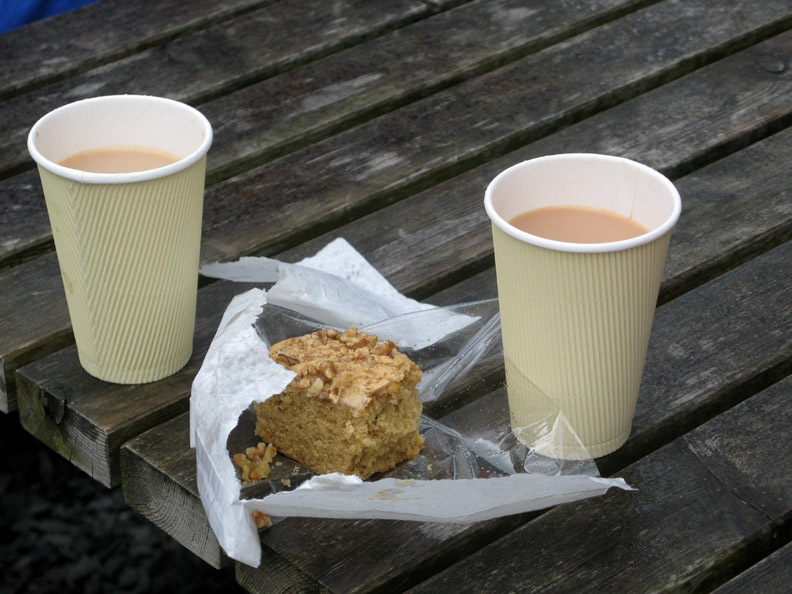 . . it's got to be a large portion of cake !